Sainsbury’s has a huge market share in the UK. Thanks to its great products and competitive prices, thousands of customers shop there every day. Those loyal customers have grown to expect quality, freshness and choice. Whether calling upon top-rated products or the Basics range, customers know that they can rely on quality products. But all supermarkets share the same problems: they are noisy, busy and hard to navigate. It is never quite a simple matter of popping in and out to get your products in a few minutes. Until now. Pinga makes it easy for you to get the products you need, fast. Using a slick app, you can call upon our network of trusted Pinga Partners who will be at your door within 15 minutes. This saves you time and can get you out of tight spots when you need something fast. The process is ultra simple. Just download our app and explain exactly what you want from Sainsbury’s. The request will be answered by a Pinga Partner who will confirm your order. Simply pay through the app then sit back and wait! All of our Pinga Partners are professional and dedicated, knowing exactly how to take care of your needs on every order. When using Pinga, you don’t have to worry about high minimum orders either. Just shopping for that special herb to perfect your dish? No need to order a basket full of items. We are also happy to take care of any courier and off-license requests, or even tasks that can help you save time. Pinga delivers any items from Sainsbury’s today. 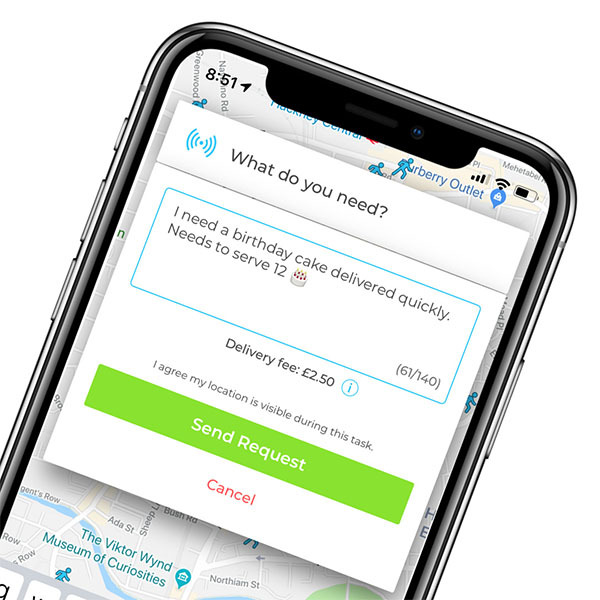 Infact our service normally delivers within an hour, so if you’re looking for same day delivers from Sainsbury’s, send your request via the Pinga App. Describe what items you needs to be delivered from Sainsbury’s and send your request. Pay securely within the app and receive your Sainsbury’s items to your door!